In March 2017, Variety Wholesalers, Inc., led by CEO James Arthur ‘Art’ Pope, announced the opening of a new company distribution center in Newnan, Georgia. The space had been vacant since January 2015 when a former Kmart distribution center closed. As the new tenant of the space, Variety Wholesalers, parent company of stores like Roses and Maxway, is bringing valuable jobs to the Cowetta County region and again making the area a hub for distribution. The Newnan Times-Herald covered the economic impact in this recent article. Every day, nearly three dozen trucks pull up to loading docks at a massive building in a tree-lined Newnan industrial park. Few local consumers realize how that building affects their daily lives. Among the freight are household products manufactured all over the world, including plastic pitchers, baskets and trash cans from Leominster, Mass. The building is a waypoint in the journey each product makes from raw material to manufacturers to distribution centers like the one in Newnan and then to the stores where consumers select them for their final trip to individual homes. Experts call it the supply chain, and it stretches thousands of miles for each unique product. Recent innovations have sought to streamline the process, such as containerized freight and automated sorting. Even the lowly barcode, a strip of printed lines, has been instrumental in improved efficiency because it allows machines to scan the codes to keep track of inventories. One of the most significant innovations, experts say, is the modern distribution center. Instead of every manufacturer having to haul its products to every retail outlet, the centers consolidate shipping and receiving, saving consumers in the process. As the population of the Southeast continues to grow, distribution centers must be built to supply the stores popping up to sell to the new residents. Georgia handles more than $900 billion in cargo each year, much of it consumer goods moving through distribution centers, according to the Georgia Department of Economic Development’s Center of Innovation for Logistics. Even transactions that don’t occur in stores require distribution centers to handle the growth in e-commerce. 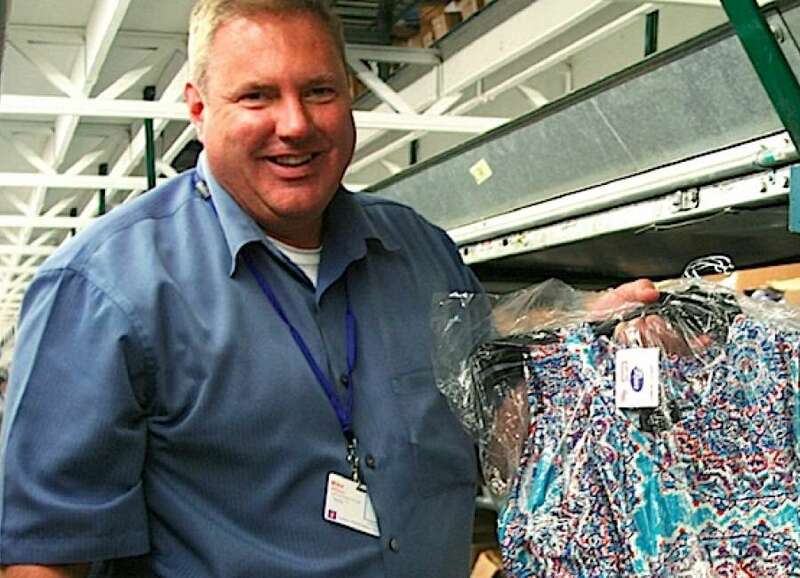 Mike Willem, Variety Wholesalers senior vice president of distribution and transportation, holds clothing that is being sorted at the distribution center in Newnan. The clothing will shipped to Roses stores throughout the Southeast. Photo courtesy of The Newnan Times-Herald. The warehouse vacancy rate fell to 5.4 percent nationally in May, the lowest in 30 years, according to the Center for Logistics. Warehouse wages continue to rise. Both trends reflect the soaring demand for distribution centers to keep the supply chain running smoothly. Nearly 50,000 people in the Coweta area work in the transportation and warehouse sector of the economy, according to the Georgia Department of Labor. That’s roughly one in every 20 people who have jobs. A huge warehouse that helped establish Newnan’s reputation as a distribution hub is once again housing hundreds of jobs and acres of merchandise. The Herring Road facility built for Kmart had been vacant since that company moved out in January 2015. Variety Wholesalers announced last August it had signed a lease with the building’s new owners for 1.4 million of the 1.9 million square feet of space. The area Variety is using, equal to 29 football fields, has space for 80,000 pallets of goods that will be shipped to stock 180 stores across the Southeast for the Roses, Roses Express and Maxway brands. That includes a Roses Express store in Newnan’s Merchant’s Crossing shopping center that recently opened. Among those pallets are plastic items from United Solution’s plant in Massachusetts. It will also serve future stores the company has planned in Georgia and neighboring states, according to CEO Art Pope. “This, for us, was a major undertaking,” said Variety President Wilson Sawyer at the company’s ribbon-cutting event earlier this year. The company was attracted to Newnan because of its location near major highways in all directions. But it was also considering other sites around the Southeast. “I knew they had a lot of options available, but they chose us,” said Greg Wright, president of the Coweta County Development Authority. The building’s size and readiness were major factors in the decision, as was use of the racks and conveyor systems that Kmart left in place, according to executives who say there are few buildings of that size available anywhere in the country. The equipment simply allowed Variety to move in faster and get up and running sooner than other sites. Variety currently has over 300 employees, some of whom had worked at the same building for Kmart, according to Mike Willems, senior vice president of distribution and transportation. And the company is still hiring, currently for truck drivers. Having former Kmart employees is helpful because they are already familiar with the building and its mechanics. Willem said the process of getting the product to stores, especially Roses Express in Newnan, is simple but hard work. Employees can be seen throughout the day sorting and moving products to the correct area. The distribution center receives 35 shipments per day in and ships out to 35 stores per day, with 90 percent of the shipments being sent to the Roses chain. Once the items are received, they are sorted, labeled and scanned to be stored in the correct zone. For instance, when a truck is unloaded from United Solutions, the clothes baskets might be stored in one section of the massive Herring Road structure while the tubs and pails are stored in another. Once the items are put away in the zone, they are ready to be pulled for shipping when needed. Information from the scanner feeds a computerized inventory that helps them keep up with the products, which range from clothing to household goods, food, and other supplies. When a store needs to replenish its inventory, the store’s computer talks to the distribution center’s computer, then the required products are automatically sent by conveyor belt to the correct truck for shipment. He said technology really helps the company stay efficient. “This is what we do every day,” he said. He said any damaged items that are not repairable are sent back to North Carolina where Variety has its original distribution center and headquarters. Willem said the staff at Variety has been great, making the entire process work to make sure it runs smoothly and on time. In the years since Kmart built a warehouse here, other companies have followed suit, including PetSmart and SYGMA.